These steel screw posts are the same size as our industry-standard aluminum screwposts. You can use these any place you would use an aluminum screwpost but want the appearance or extra strength of steel. These screwposts feature a low-profile, flattened head on both the screw and the post. They have a nice clean look when used for binding photo albums, scrapbooks, samples, leather products, store and trade show displays, and more. ¼" and smaller posts are threaded all the way through to give them more strength. This means the head of the post has a hole in the middle, like the image to the right. No expensive binding machines to buy — just a simple paper punch and you can get started. The size given in the table is the thickness of your document (or other material) that the post will handle. If you are using screw posts on very heavy materials, such as carpet samples, we recommend you use our Round Head Heavy Duty Steel screw posts. 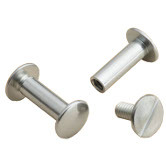 Note: Standard steel screw posts 3/8" and longer can be used with our perma-lock screws to make a permanent assembly. Screw heads are slotted; post heads are plain. The screw and post heads are 0.415 inch diameter. 1/4 inch and smaller posts are threaded all the way through the post for added strength. 3/8 inch and smaller posts are supplied with 1/4 inch long screws to fit the posts. 1/2 inch and longer posts are supplied with 3/8 inch long screws. Screw posts are sold in sets of one post and one screw. The quantity per package is the number of sets (either 10 or 100 sets per package).